I came across this Japanese pancake called Okonomiyaki, “as you like it pancakes!” I had leftover ingredients from yesterday’s steamed dumplings so I thought this would be a perfect recipe to make. And even though this is a totally scaled down version and may not truly be called Okonomiyaki, I like saying Okonomiyaki, so I am calling it Okonomiyaki! Make the flax egg. Shred the cabbage and slice the scallions. In a big bowl, combine the flour, water, flax egg, cabbage and scallions. Mix well. Heat oil in a non-stick skillet. Pour half the batter into the pan and cook on medium high until golden on both sides. Do the same for the second pancake. Enjoy! p.s. there are special Okonomiyaki sauces. Vegan versions would be Vegenaise and vegan Worcester. But personally, I like it plain! 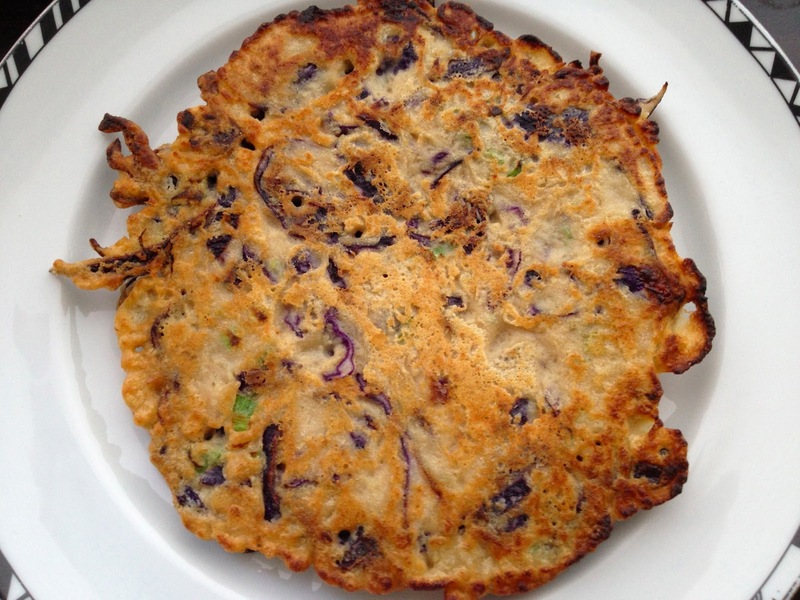 The Okonomiyaki recipe sounds interesting, but what does one do with the “flax egg”? Is it mixed and eaten raw on the side, or cooked and dipped in the sauce? If cooked, how?